There will not be a human alive who will dare look you in the eye when you are wearing your Ghoulish Glasses! Set in classic black frames, these scary spectacles feature zombie eye lenses that will turn any gaze into a fearsome, hungry glare. Not to mention, these glasses are a great way to give anyone a start, especially when they catch sight of your eyes for the first time. 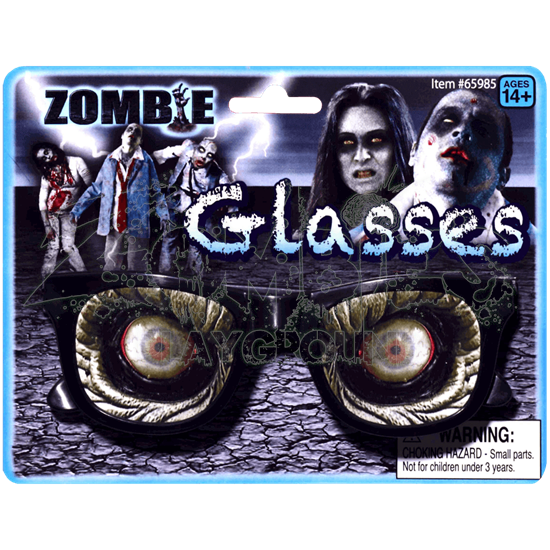 These glasses are set in a plastic black frame, and instead of traditional lenses, they feature lenses painted to resemble a zombies features and eyes. Gray, wrinkled skin can be seen around the eyes through the lenses, as well as wide, milky eyes that feature hazy color and a vibrant, ravenous stare. Aside from being a great novelty accessory to wear for fun and fright, the Ghoulish Glasses are also a great option to use instead of contact lenses. All you need to do is paint your face and don the glasses, and suddenly, you will have the eyes of a feral and hungry zombie!